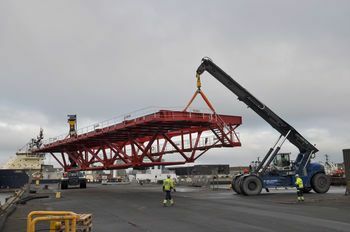 On Monday morning, Blue Water’s terminal crew transported two advanced steel structures weighing 99 and 65.5 tons to the Northside of the port where the installation vessel “Seajack Scylla” is berthed. The vessel is being mobilized for an offshore project. The large steel constructions have been manufactured by Semco Maritime. “The project was solved without problems and all the challenges in the safety area was analysed and solved prior to transport. Blue Water have vast experience with transporting large items in the port area and that is why we chose them. They lived up to our expectations in full”, says Morten Kjeldmann, Senior Project Manager in Semco’s rig-division. Blue Water was also pleased after the delivery of the steel structures. “The solution we offered Semco was good in terms of safety and economically. Our terminal crew know precisely how to transport large items. Also in places where the lack of space can be challenging”, says Allan Leiberg Brodersen, responsible for sales and development in Blue Water’s project department. The transport was carried out as expected and every detail was planned. This was also the reason why six lamp posts were dismounted to create a free passage. One of the heavy steel constructions are lifted out of the production hall.